Tailed Beasts (Bijuu) are demons that exist in the world of Naruto, they are also known in as demons in Japanese mythology. Each one has an incredible amount of chakra within them. To try and combat these powerful beasts and stop the destruction they cause, they were captured and sealed inside new born babies using a powerful technique that would kill the person using it. The Fourth Hokage was one of those people who sacrificed their life to seal a Bijuu and protect the world from chaos. When the human has a demon sealed inside them they are known as Jinchuriki. Every demon has a different amount of tails, ranging from one tail to ten. 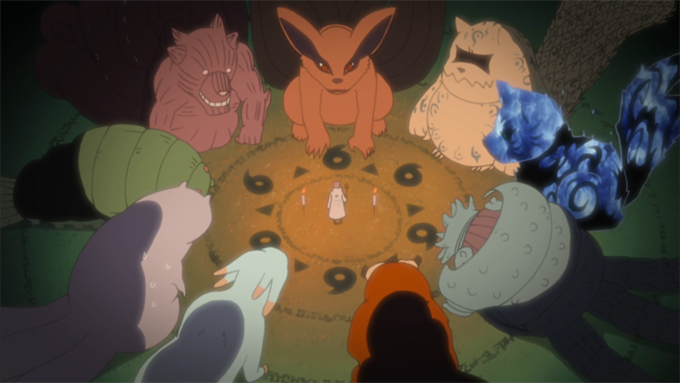 The nine separate tailed beasts that exist today were created from the chakra of the the Ten-Tails, the original demon. The Ten-Tails was subdued by the Sage of the Six Paths and sealed within his body to become the first Jinchuriki. However, this method was only a temporary way of sealing the demon, as once the Sage died, the Ten-Tails would be free again. As the Sage was close to death, he used his "Creation of All Things" ability to split the monster into nine tailed beasts and scattered them across the world. Ichibi no Shukaku, takes the form of a racoon. 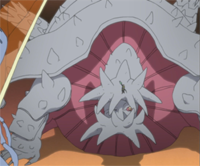 This demon was sealed within Gaara. Nibi no Nekomata, takes the form of a two-tailed cat. This demon was sealed within Yugito Ni. Sanbi no Kyodaigame, takes the form of a three-tailed turtle. This demon was sealed within Yagura. Yonbi no Saru, takes the form of a four-tailed monkey. This demon was sealed within Roshi. Son Goku is also known as King of the Sage Monkeys. Gobi no Irukauma, takes the form of a five-tailed dolphin-horse. This demon was sealed within Han. Rokubi no Namekuji, takes the form of a six-tailed slug. This demon was sealed within Utakata. Nanabi no Kabutomushi, takes the form of a seven-tailed beetle. This demon was sealed within Fu. Hachibi no Kyogyu, takes the form of an eight-tailed octopus. This demon was sealed within Killer Bee. Kyuubi no Yoko, takes the form of a fox. 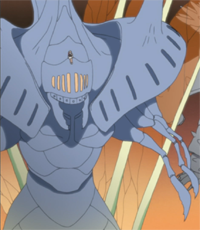 This demon was sealed within Uzumaki Naruto, who has incredible stamina and can summon large amounts of the Kyuubi's chakra. Other translations include: Kyuubi, Nine Tailed Demon Fox, Kitsune. 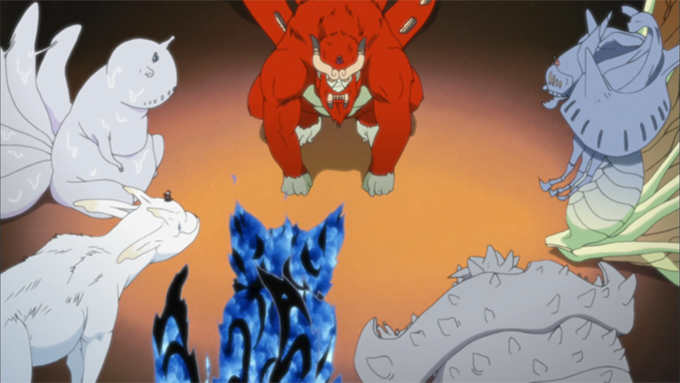 The Ten-Tails is the original demon, it was sealed inside the Sage of the Six Paths, until he split the demons chakra into the nine tailed beasts that exist today.